Thermal, Calif.—Jan. 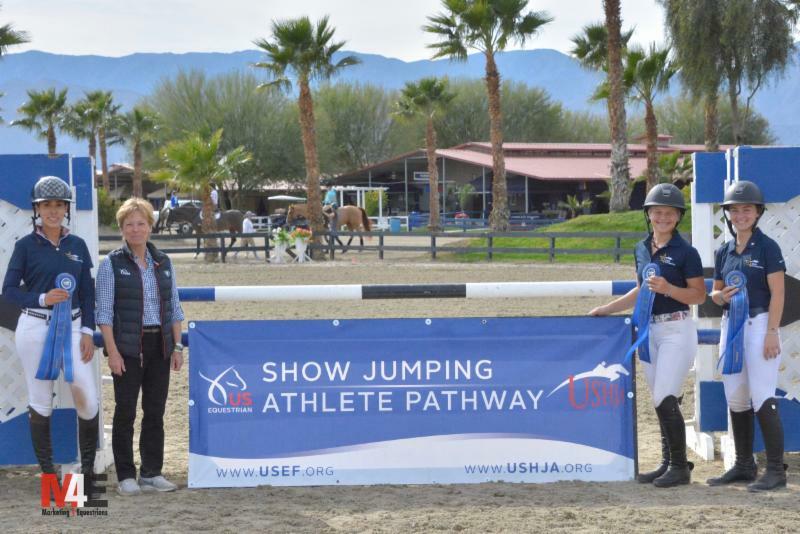 21, 2019—The USHJA Gold Star Clinic - West wrapped up an educational week with presentations by experts in the sport of Show Jumping, combined with riding sessions taught by distinguished Olympian Katie Prudent. Riders qualified for the Gold Star Clinic - West through the USHJA Emerging Jumper Rider Program and the Zone Jumper Team Championships. 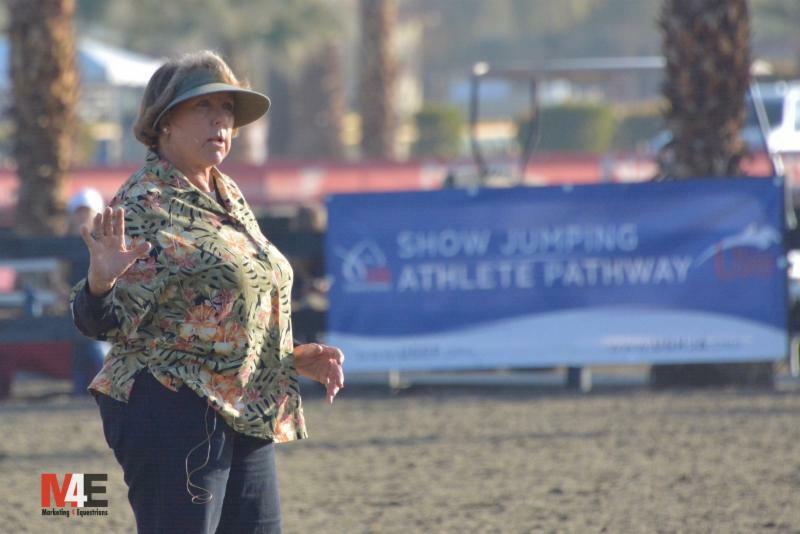 AON HITS Desert Horse Park in Thermal, California, hosted the event, January 17-20, 2019. Sunday featured an exciting Gold Star Team competition with eight teams at heights of 1.10m, 1.20m and 1.30m vying for the top honors. Guest Chefs d'Equipe included Olympic rider Will Simpson, Kirsten Coe, Diane Carney and DiAnn Langer, USEF Youth Chef d'Equipe/USHJA Show Jumping Technical Advisor. Riders had the exciting opportunity to walk the course with their experienced Chefs and hear tips on how to ride the Martin Otto designed track. Feature clinician Prudent provided feedback to the riders after each round. Erin Keating, USHJA Managing Director of Sport and USEF "r" judge, served as the official and scorekeeper for the event. AVSU provided the sound. Langer's Team 7 with Grace Belmont, Jasmine Talley and Natalie Gerst took the early lead after round one with only 4 faults. Coe's Team 8, with Lauren Flather, Gerst and Rachel Long, gave Langer's team a run for their money with all riders jumping clean in the jump off, but Langer's team held the lead for the win. Coe's team finished in second, Simpson's Team 3 took the third place spot with riders Olivia Williams, Jerra Mays and Amelie Bittar (see full results below). Langer's winning team participated in a press conference to test their interviewing and media skills, which were practiced during the week with Brenda Mueller of Marketing4Equestrians. Throughout the week, riders worked one-on-one with Mueller of West Palm Beach, Florida, on media exercises, which included branding, talking about sponsors and interviewing skills. Mueller conducted interviews with the riders on the first day, and riders viewed each other's videos the following day to take away key learnings. The group visited Coe's Red Top Farm in the stable area to learn about Young Horse Line Judging with US Equestrian Team Veterinarian Dr. Geoff Vernon, Sevriens and Prudent. Riders joined their team members for an amazing hands-on experience and judged each of the horses as they learned what to look for from the experts. 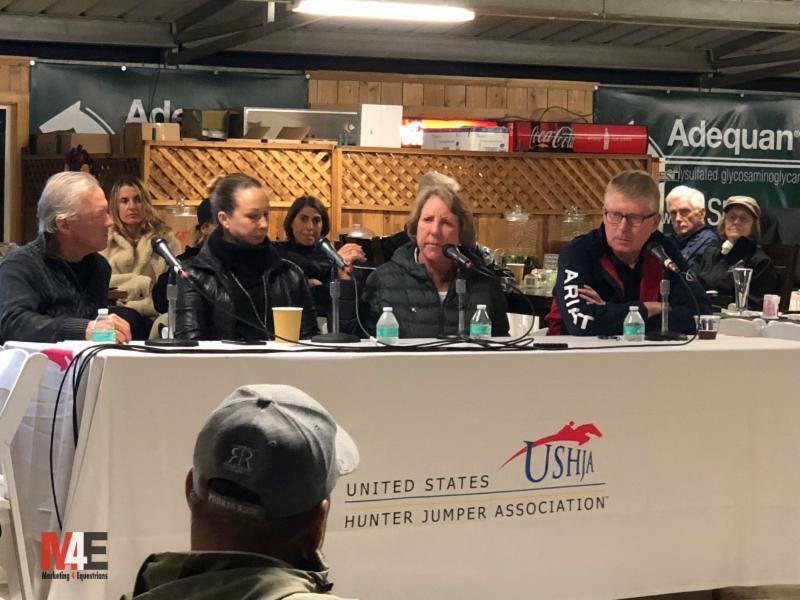 USHJA extends special thanks to owners Terry Bucher of Equine Trading Company, Inc., Haley Schwab and the Foley Family for loaning the horses to the clinic for the session. Day two started bright and early with barn chores with Colleen Reed followed by flatwork sessions with Prudent. Prudent had riders work without their stirrups and canter exercises with ground rails. She emphasized a rider and horse's ability to shorten and lengthen and encouraged riders to be familiar with the terminology of the sport. "We need to start at an early age, developing our riders so they are not only good riders but also good horsemen," said Dr. Vernon. "In my lectures, I really emphasize the basics and those basics are used to build on and improve performance and from that improved performance, hopefully, out of this group, we develop a squad of outstanding young riders that can go on and be outstanding professionals if not outstanding team members." The clinic finished up back in the classroom with The Show Jumping Athlete Pathway "How Little I know About the Sport I Play," presented by Langer. "The opportunity to ride with Katie (Prudent) has been so fun. We get so focused on the canter, the jumps and the distances, that we forget about the simple little things that in the end, matter so much. 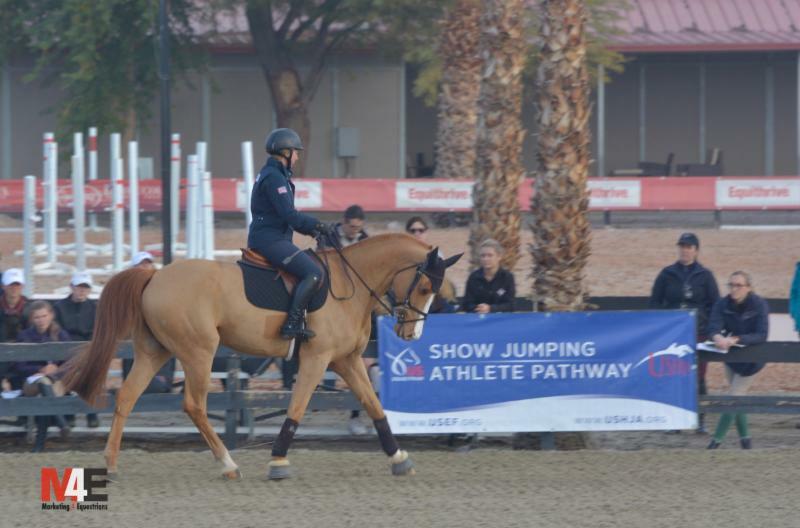 She gives tips and tricks for something as simple as the walk, that just helps everything you do," said Gold Star Emerging Jumper Rider Rachel Long. "The basics are just so important," said Prudent. "If we can teach them proper basics, they have the building blocks to become better riders." Expert high performance farrier and horseman Billy Liggett of Woodstock, Illinois, led a fun and educational presentation, No Foot No Horse. The hands-on education allowed riders to feel the traction of different types of shoes in different footing, to watch how the horse moves to determine how to trim it, and to learn how the nail operates in the horse's hoof wall. Riders then learned how to pull a shoe correctly and several had the opportunity to act as farrier and pull a shoe themselves. Ashley Stannard and Ashbrook Farm, Tucson, Arizona, generously offered Dawn Valerius' beautifully turned out horse Mirival, for the demonstration. Riders headed back to the ring for a discussion with world-class course designer Martin Otto on Dissecting the Course. Participants walked the track for Sunday's Team Competition with Otto. "I think the presentations have been the best part of the clinic," said 1.30m Gold Star Emerging Jumper Rider Sloan Elmassian. "People think of a clinic as only mounted riding time, but going to the classroom and learning something new or extending your knowledge is more rich than the riding. Of course the riding is important but the knowledge behind the riding really makes it come full circle. You're going to be more successful in the ring if you have all of the tools. I would absolutely, hands down recommend this clinic! There is something to learn everyday, and you never stop learning." Saturday night included a dinner in the HITS VIP Pavilion featuring a panel discussion with today's experts in Show Jumping, Olympians Simpson and Prudent, Dr. Vernon and Coe. 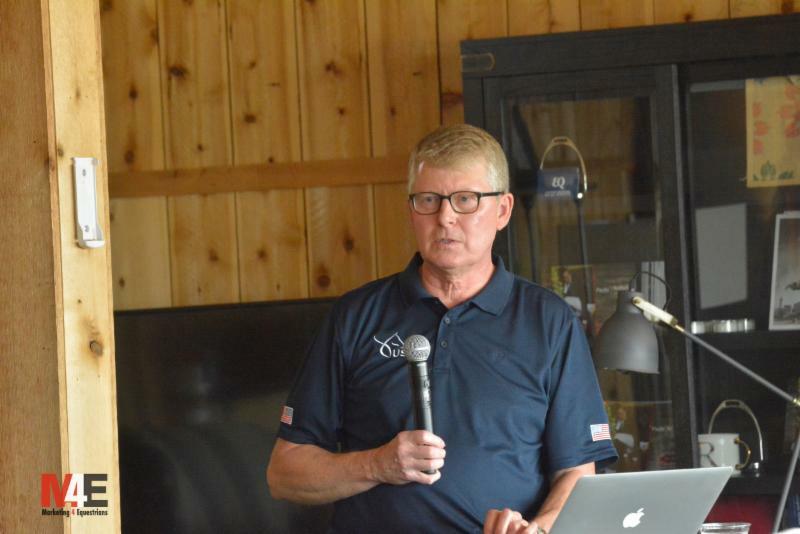 Over 100 guests, including equestrian greats such as Hap Hansen and John French, listened to the question and answer session with topics that included working students, what it's like to be a professional trainer/rider, tips on training and competing and favorite horses in their careers. Learn more about the USHJA Zone Jumper Team Championships at ushja.org/zonejumper. Learn more about the USHJA Platinum Jumper Championships at ushja.org/platinumjumper. 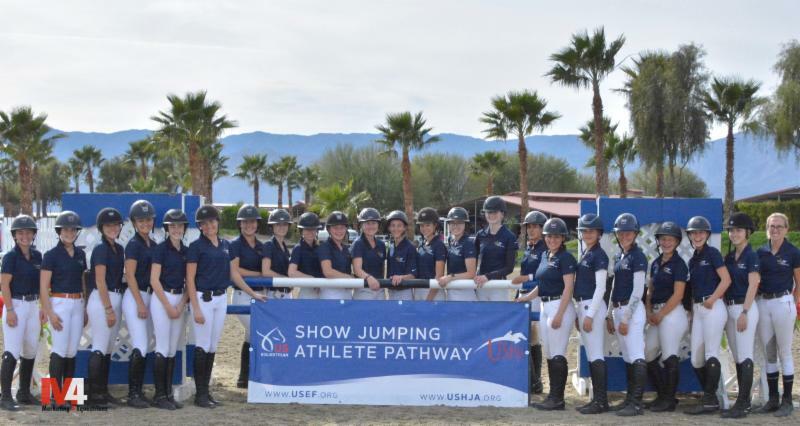 Learn more about the Emerging Jumper Rider Program at ushja.org/emergingjumper. 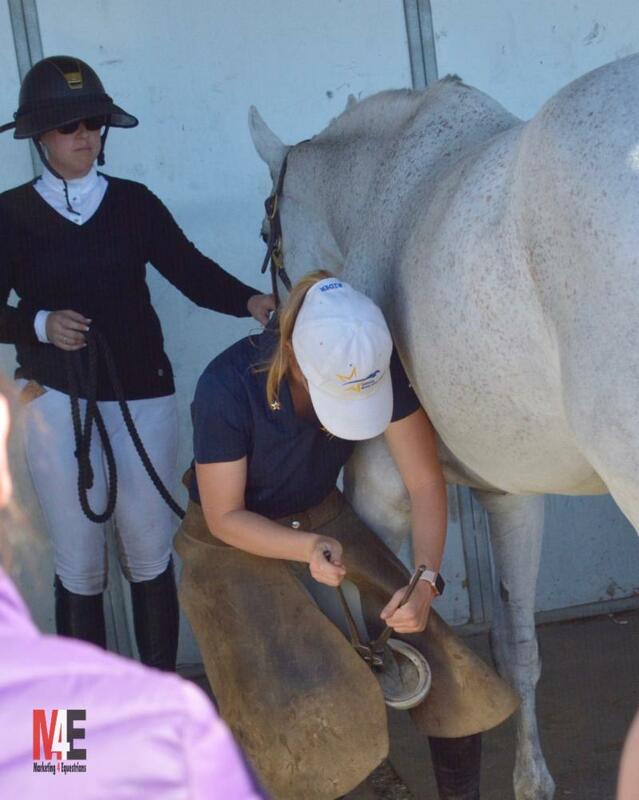 See the USHJA Facebook, Twitter and Instagram pages for all the best clinic moments captured in photos.